Yang Huiyan According to Forbes magazine in October 2007 the richest person in China was Yang Huiyan, the 26-year-old daughter of Yang Kwokkeung, a former farmer, brick layer and construction worker whose income soared when he floated the stock for his property development company on the Hong Kong stock market in 2007---creating four other billionaires. Yang’s worth was estimated by Forbes to be $16.2 billion, more than five times the worth of the top finisher of the Forbes China list in 2006, Huang Guangyu, owner of the Gome stores, and richer than George Soros, Rupert Murdoch and Stephen Jobs. Most of Yang’s money is from the property empire founded by her father. It is not clear exactly how Yang Kwokkeung made all his money. He grew up poor, tending cows as a child, and didn’t own a new shirt until he was 18. He began working on construction sites after his father’s gambling losses left his family without money. His luck appears to have turned when he was 24 and began working for a property management firm. Within six years he was head of its construction division. In the early 1990s, with several partners, Yang began buying up property and wasteland at a time when the property market was shaky and property values were low. His timing was perfect. He started out with 87 hectares of farmland and bought more and more land as the real estate market boomed. He now owns an estimated 18 square million meters of land---the forth largest land holdings of any developer in China---most of it in booming Guangdong province. Zhang Yin, a 49-year-old woman and founder of Nine Dragons Paper Co., was ranked as the richest person in China in 2006 and the richest self-made woman in the world, with an estimated net worth of $3.4 billion, more than Oprah Winfrey or Harry-Potter-author J.K. Rowling. On the Forbes list she was ranked fifth, with a net worth of $1.5 billion, up from 107th in 2005. Zhang Yin, who also goes by the her Hong Kong name Cheung Yan, made her fortune turning recycled paper from the United States and Europe into packaging in China used to in everything from toys, to electronics to furniture. Much of her wealth was created when she listed her company on overseas stock markets and stock prices surged after announcing a net profit of $174 million in fiscal 2004. Zhang is the eldest of eight children born into a military family in Heilongjiang Province She said in one interview that when she was growing up her family only ate meat on holidays and the clothes they wore were often patched. During the Cultural Revolution her father was sent to prison after being branded a “capitalist roader.” In the United States, she married her second husband Liu Ming Chung, who was born in Taiwan, brought in Brazil and speaks fluent English. He is her chief business partner. Her oldest son is on the board of directors for her company. Her brother is the company’s deputy chief executive. Those that have worked with her say that Zhang is driven and tough and she uses carrot and stick tactics to get the most out of her employees. A former partner told the New York Times. “When her employees asked for a pay raise, she would grant it if it was reasonable. But when her employees made mistakes, she would criticize them severely. She made it clear when to reward and when to punish.” Others credit her success to her skills as an astute deal maker and her outgoing personality. 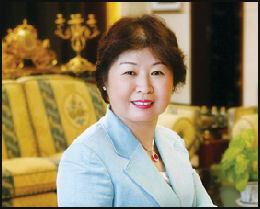 Pocketing substantial profits she moved six years later to the United States, where she founded America Chung Nam, currently the largest exporter of scrap paper from the United States and the world’s biggest paper trading company. As late as 2002 she and her husband were driving around the United States in a rented Dodge Caravan begging garbage dumps to sell her their scrap paper. Zhang made substantial profits cashing in on paper shortages in China and using superior paper from the United States (paper there is made from wood pulp as opposed tp grass, rice stalks or bamboo as is the case in China) and shipped huge containers full of paper to China. Chung Nam has shipped more material from the United States to China than any other company for consecutive years since in 2000. The Hong Kong University student organization’students and Scholars against Corporate Misbehavior (SACOM)---reported on abuses of workers at Nine Dragons Papers, owned by Zhang Yin. In 1995, Zhang set up a mill in Dongguan in the Pearl River Delta of Guangzhou to handle paper imports from the United States. As of 2007, the mill was the biggest manufacturer of paper in China, with 11 giant paper making machines, 5,300 employees, and $1 billion in annual revenues. A huge new facility is under construction in the Yangtze River Delta near Shanghai. Zhang once said, “My desire has always been to be a leader in an industry.” The paper mill in Dongguan became the cornerstone of Nine Dragons Paper, now China’s leading manufacturer of container board, a business that has grown exponentially as demand for packaging for all kinds of products has grown. Nine Dragons went public in March 2006 when it was listed on the Hong Kong market and raised $500 million. By January of 2007 its value quadrupled to $5 billion, with Zhang’s family controlling 72 percent of the shares. Nine Dragons is poised to be a major player in the world. It has cheap labor and some of the most advanced paper machines in the world. Profits for the company were $175 million in 2006, a 349 percent increase from the previous year. Nine Dragins can not keep up with demand even though it continues to grow at a break neck pace. Deng was born in 1968 in Xuzhou, Jiangsu province, a coastal province in China, at the height of Mao’s Cultural Revolution. She has talked about growing up "very, very poor" in a small town in China, as the daughter of a factory engineer. Deng eventually landed in the United States, including earning a master's degree at the Yale School of Management, where she now serves on its Board of Advisors. Before she met Murdoch, she married the man who had sponsored her student visa in the United States during the late 1980s. She'd secure a "green card" to stay permanently in the United States -- but her first marriage proved brief. Melinda Liu wrote in Newsweek, “Wendi grew up during a bloody period in her country’s history. Her parents, devout members of the Communist Party, first named her Wenge, meaning “cultural revolution,” to reflect the times; as the mood lightened in the land, she changed her name to the more agreeable Wendi, or “cultural enlightenment.” Her father, a factory manager, and her mother, an engineer, earned a combined monthly salary of about $43 on which they supported a son and three daughters. Although Wendi later described living conditions as “very, very poor,” by the standards of the day, they led a white-collar life.” She changed her name to Wendi in her teens when China began opening up to the world. In 1987 Deng met Jake Cherry, a businessman from Los Angeles who was in China to establish a freezer-making factory. He helped her to move from Guangzhou to Los Angeles when she was 19 and sponsored Deng's visa to the US where, according to a 2000 profile in the Wall Street Journal, she lived with Cheery and his wife Joyce and shared a bedroom with their five-year-old daughter. Jake Cherry divorced his wife and in 1990 married Deng who had enrolled in California State University at Northridge. The marriage ended after less than three years but that was long enough for Deng to secure a green card and live in the U.S. as a resident alien. “I loved that girl,” Jake Cherry told The Wall Street Journal. ‘she told me I was a father concept to her, and it would never be anything else.” Wendi then went on to Yale to study for an M.B.A. and then landed a job at the Asia-based Star TV, owned by Murdoch’s News Corp. as an intern in 1996. By some accounts she won a place at Star by chatting up a Star executive on a flight to Hong Kong. Reports on how Deng she met Murdoch differ. One version has it that they were introduced at a party in 1998; another that she worked as his interpreter in Shanghai and Beijing. Many say had met Rupert at a corporate event and cocktail party in Hong Kong in 1997 and chatted away the night with her. The meeting took place shortly after Deng's after her graduation from Yale. According to Australian journalist Eric Ellis the first time Deng met Murdoch she accidentally-on-purpose spilled red wine on his trousers. At the time Murdoch was married to Anna Torv, his serene wife of 30-some years and the mother of his children Elisabeth, 42, Lachlan, 40, and James, 38. Rupert later said in interviews, it was a whirlwind romance. He also told Vanity Fair magazine that he was a "a recently separated, lonely man" when he met Deng, and asked her out to dinner in London and "talked her into staying in London a couple of extra days." He said that the idea the affair began while was married was "complete nonsense." Describing the break up with his second wife, Murdoch told Vanity Fair, "I was traveling a lot and was very obsessed with business and perhaps more than normally inconsiderate." He said with the children grown "the family home suddenly became a home for two people without their central shared interest...We drifted apart to the where things became very unhappy." In July 1999, at the age of 68, Murdoch married then 32-year-old Deng in a private ceremony aboard his yacht Morning Glory in New York harbor. There was a 12 minute fireworks display set to Frank Sinatra's New York, New York . The wedding tok place 17 days after his divorce from the stunned Anna (the settlement reportedly awarded her more than $1 billion). Her Yale profile notes she's a co-founder of Big Feet Productions, an independent studio in East London that makes applications and games for Apple operating systems according to its website. And in 2011, she produced, "Snow Flower and the Secret Fan," a film set in 19th century China centered on two girls who circumvent cultural restrictions on females. “In the early days of their marriage, Liu wrote, Wendi was steeped in Rupert’s business, especially the social-networking site MySpace in China. But in the past few years, she has been largely focused on her children, fundraisers for maternal health, and caring for an aging husband “who’s not as vigorous as before,” as one former Murdoch associate puts it. In 2011, Ms Deng famously leapt to her husband's defence to slap a protester who threw a pie at him as British MPs quizzed him over a phone-hacking scandal that led him to close one of the titles, the News of the World. The protester, comedian Jonnie Marbles came at Murdoch with a shaving-foam pie. Deng leaped into action, lunging at Marbles and smashing his hand with her own. "Mr. Murdoch," said parliamentarian Tom Watson, who minutes earlier had been particularly critical of the media titan, "your wife has a pretty good left hook." Social media erupted in response to what soon became known as "the slap heard round the world" and earned her the sobriquet "tiger wife." The reaction was particularly strong on Chinese microblogs, where many hailed Deng's reaction as a moment of pride for Asian women. "The harder she slapped, the more we can tell how eager she was to protect her husband ... she is still a woman who longs for love," wrote one person under the handle MissQccc. Deng was praised as a "tiger woman" and "Charlie's Angel". "The image of Chinese women just got a lift," noted a post on the Weibo microblog by Toubenxingfu111. "This adds value to the image of Chinese wives," said another under the name Jihua. "They have previously proved their ability to cook and run a business. Now they can add bodyguard." Others noted that Deng---a volleyball player in her school days---had not just spiked the pie-thrower, she had also lifted the share price of News Corporation. Several posters said the incident had changed their views of Deng, who had tended to divide opinion in China. "I never used to like Deng because I thought she was too materialistic, but I like her now," said a blogger under the name Jixunli. The celebrity focus on Deng by bloggers contrasts with the political approach of the state media, who have tried to use the hacking scandal to score points against the western media. "This incident directly exposes the inherent money-seeking nature of western media today, and the false nature of the concepts of 'freedom', 'impartiality' and 'human rights' that they have long bandied about," noted Xinhua news agency in an opinion piece. "As the scandal has continued to develop, it has become a major assault on the model of media supervision and control in the west." Editorial control in China, however, is ultimately concentrated in the hands of the propaganda department, which faces less scrutiny, accountability and competition. "The Xinhua piece itself, stripped of all nuance and serving the narrow objectives of China's Marxist view of journalism, is an illustration of much that is wrong with Chinese journalism," noted David Bandurski on the China Media Project website.